As the summer festivals have slowed down and I've gotten some breaks between commissions, I've had time to work on a few new unique designs. I enjoyed making - and showing off! - the textured wall hanging, but I wanted to do something even bigger that could be a perfect mantlepiece, or perhaps go above a headboard. Thanks, George, for the photo! 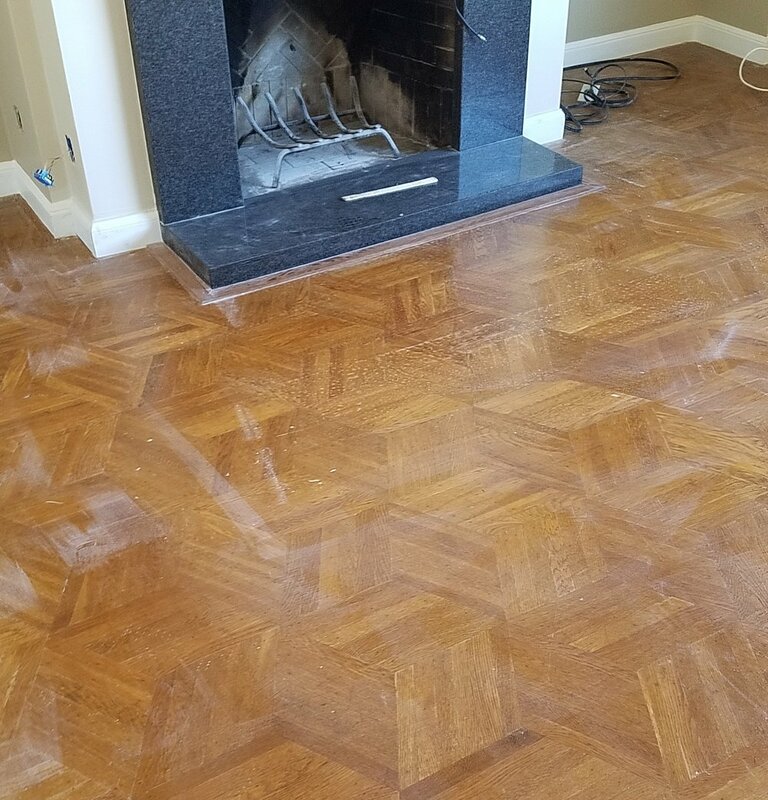 I had just started sketching a few simple geometric patterns when I visited a remodel-in-progress of a friend in San Francisco's Laurel Heights; though they had yet to refinish the floors, I was blown away by the workmanship in the solid-oak original hexagon-patterned hardwood floor. Thus, we have this first triptych, highlighting the rich contrast between maple, wenge, and walnut. Cutting and fashioning this into each hexagon gave me newfound respect for the workmen installing that floor, as I presume it was done with far fewer power tools when that house was built over 80 years ago! And on a similar theme, I built this square triptych, with the same woods. Check both of them - and the "Lenticular" textured piece as well - in the store here. I had started the woodworking for a table-top lamp back in early March, but it sat half-finished since due to a lack of knowledge of the compact lighting parts with which to complete it. This is the second time I need to give credit to Konrad Jarausch of Sunlight Inside, who pointed me in the right direction both for the form factor and a few suppliers of high-power low-voltage compact LED lights. (Check out that earlier post about LED lighting here). I paired that with a large heatsink and satin-finished acrylic tubing to create this light, which can be configured from two to five layers for a desktop lamp 6" to 15" tall. You can see this in the online store here. Several customers have expressed interest in a "Nixie" clock. The first time I was asked, I didn't know what I was, so I started reading up. The name Nixie is expanded from Numeric Indicator Experimental (NIX); it is a product of the mid 50's to early 90's and is no longer manufactured. Nixie tubes are the predecessor to the light emitting diode (LED). They look like vacuum tubes, but are in fact a form of neon lamp filled with a mixture of Neon gas and a small amount of Mercury or Argon. Inside the tube are ten successive formed wire digits as cathodes, and a wire mesh anode. Each cathode digit and the common anode has a pin at the bottom of the tube. To light a digit you simply apply voltage between the common anode and the digit pin; when energized the digit illuminates with the warm glow of neon. Though these tubes are no longer made new, there are probably hundreds of thousands of "new old stock" - which despite the apparent contradiction, is not a typo. These are decades-old spare of warehoused inventory that was never used, and in many cases, in the original packaging. The old stock is primarily located in Eastern Europe, though there are a few American supplies as well. I've been unable to find a lot of pictures of original hardware using these, though I did come across this calculator - which apparently had a fairly short sales life due to the small time window before the introduction of the much cheaper LED-based display. 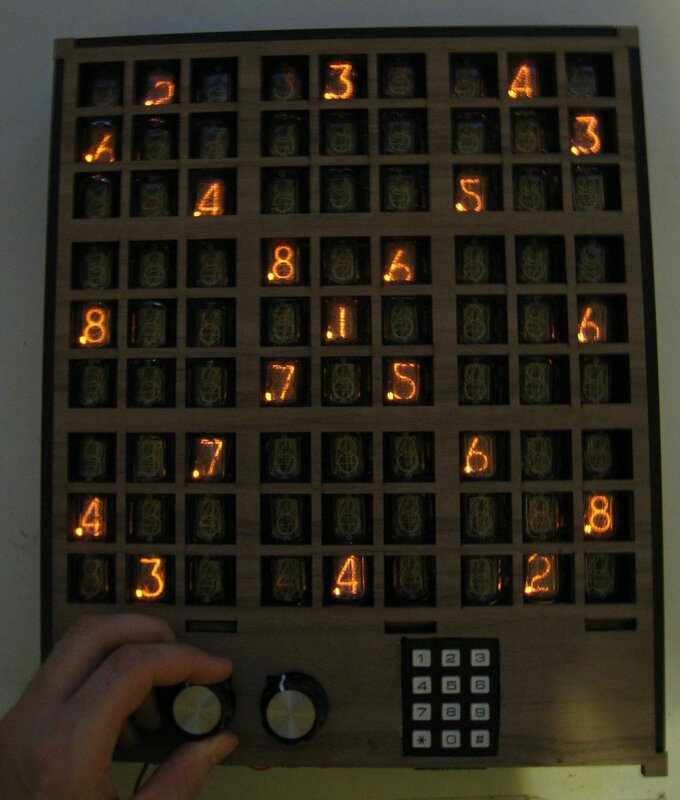 However, now they show up primarily in artistic and steampunk clocks, or occasionally in a unique one-off pieces like this impressive Sudoku game! Though I hope this doesn't linger unfinished nearly as long as the lamp I just completed, it may take a while to finish: the circuit boards are from UK; the Nixie tubes just arrived from Ukraine. I just completed the assembly of the first circuit board, though it still needs some troubleshooting. And I'll need to design and machine a (wood, of course) enclosure that has tight tolerances for all the switches and tubes. Perhaps this is the final motivation to get a CNC, which will also allow me to carve some of those mazes and geometric patterns? Regardless, as I make progress here, I'll share a few updates & photos.